Back at the dawn of personal computing, people began to talk about The Next Big Thing on the horizon—a paperless office. Computers would make our lives so simple that we would no longer need documents on paper. Decades later, this utopian state is still not a reality. Businesses deal with about as much paper as they always have. In our personal lives, we wrestle with ever increasing piles of invoices, correspondence, tax documents, and junk mail daily. In his wonderful iBook, Paperless, David Sparks demonstrates the concept of scanning all of your paperwork and filing it away electronically. This book is available in the iTunes Bookstore for $9.99 and is an eyeopener. Imagine, for example, scanning all your bills such as utilities, credit cards, and others every six months and at the end of the year, making a CD with everything from that year on it. File that away with your tax return and you’re done, paperlessly. The key to going paperless is a good scanner. Businesses use fairly expensive, high-speed scanners but if you want to organize your personal life, these are often too costly. Flatbed scanners are good for many tasks, but are really time-consuming and fussy for scanning stacks of paper. The ideal solution is a smaller, moderately priced unit that quickly scans multiple pages at a time. 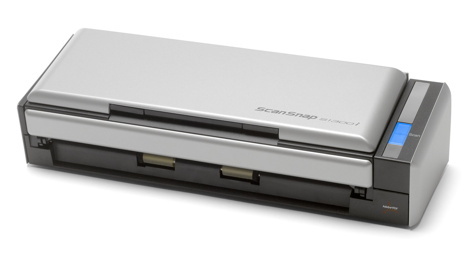 This perfectly describes the ScanSnap S1300i scanner from Fujitsu. The scanner is equipped right out of the box with cables to power the unit from a wall plug and also includes cables that will allow the scanner to be powered from your computer via USB. Since this unit only weighs 3 pounds, it would be quite possible to take it along to a seminar or event where there will be lots of paper distributed. Imagine scanning everything and leaving all that paper behind. 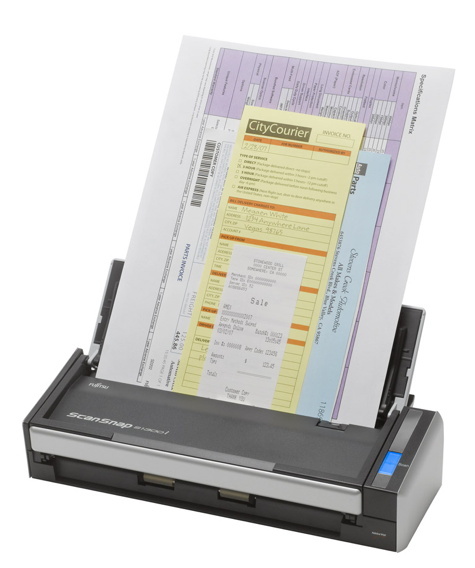 This tidy scanner will accept up to 10 pages at a time and has a conveniently compact footprint. It measures 11 inches wide, 4 inches deep, and stands only 3 inches tall when closed. Once the ScanSnap Manager app is installed on your Mac (or PC), you open the scanner to turn it on and simply place your documents in the feeder and press the only button. The scan and the conversion to a PDF, JPEG, or text document is quick and efficient. The scanner can handle up to 12 pages per minute and it will scan both sides in one pass if you desire. You can set profiles that are saved for future use: scan to a folder you select, scan to email, mobile device or printer. This includes Color, Grayscale, and Black and White scans. In addition, the ScanSnap software allows you to scan to a variety of third-party applications: Google Docs, Word, Excel, and PowerPoint. It even scans to cloud-based apps such as Evernote and Dropbox. The included software performs very accurate Optical Character Recognition (OCR) scans so that it is possible to create editable PDFs. There are a number of third-party apps included on the installation disc. Some are for the Mac: Cardiris for performing OCR on business cards, ABBYY FineReader for performing OCR directly to Word docs, and a copy of Evernote for those who don’t already use it. The unit will also scan photos directly to iPhoto. On the Windows side, there is ScanSnap Organizer, Cardminder (same function as Cardiris above), Scan to Microsoft SharePoint, and ABBYY FineReader for Windows. Included on the installation disc is a very complete manual. Its 489 pages thoroughly cover both the Mac and Windows platforms including installation, settings, operation, OCR options, and troubleshooting. I had trouble installing the software on the Mac but after some time with tech support, it appears that I received a defective disc. The support person I contacted was helpful, patient, and knowledgeable. As a bonus, he knew the Mac platform well, something that is not always the case. The Cardiris app bundled with the scanner is for use only on older PowerPC Macs so it wouldn’t even load on my recent Intel machine. There some convenient touches that reveal the careful thought went into this unit. There is no power button; just lift the lid and it turns on and is ready to go. It opens wide so that if lint or paper fuzz collects on the glass or rollers, it is very easy to clean. If a scan is skewed, the software straightens it. The icon that sits in your dock changes color to indicate the status of the unit: On, Off, and whether the scanner is being powered by its power cable connection or USB. 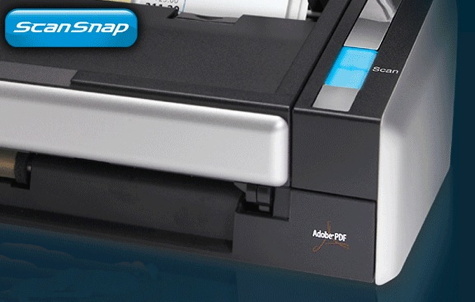 The ScanSnap S1300i rates all Pros and almost no Cons. It’s a pleasure to use because it is so simple to use. If you want to de-clutter your paper-filled life and begin to get organized, this is absolutely the way to go.